Experience the California Wine Country without leaving beautiful downtown Sausalito. 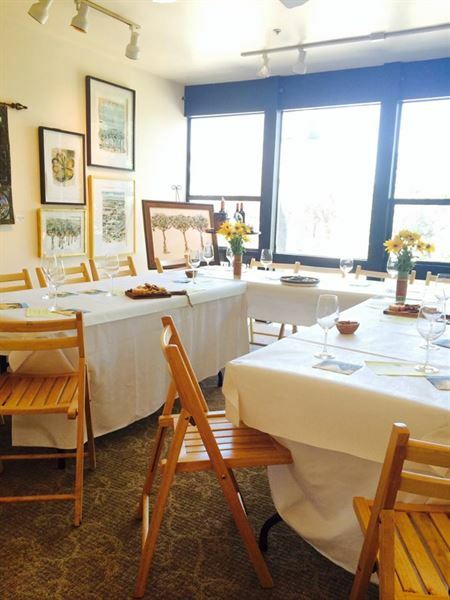 Our two-floor tasting room and art gallery overlooks the San Francisco Bay and harbor. A friendly and knowledgeable staff is here to help you find the wines that suit your tastes and to pair with your favorite foods. Taste hard-to-find wines from Kistler, Patz & Hall, Krupp Brothers, Signorello, Williams Selyem, and more. And, we will be glad to pack them up to ship or take home with you. We ship wine to all 50 states. At the downstairs bar for up to 20 people. A guided flight of four different wines starts at $10 per person. A seated tasting featuring four high-end and exclusive wines such as Morlet, Silver Oak, Pott, Blankiet and Kobalt. $60 per person, including cheese, crackers, and fruit, antipasti, etc. and a glass of wine after the tasting. This can also be done cocktail style, rather than seated. Up to 100 people on both floors. Evening event includes tasting and paired appetizers. Starting at $60 per person. Catered meals prepared to pair with the wines. Menu options available upon request.